Version 5.0.505 is a free update for anyone with version 5. If you a running an older version then click here to find out how to update to the latest version. 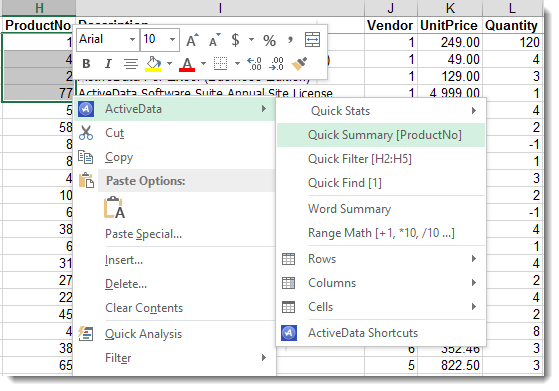 A number of commands have been added to Excel's context menu, the popup menu Excel displays when you right-click on a cell or range of cells. 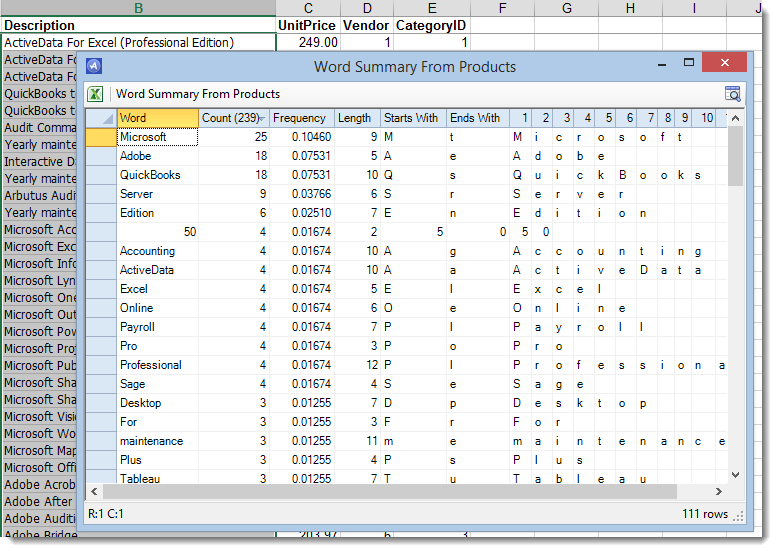 "Quick Summary" summarizes the worksheet by the currently selected column. This produces a new popup summary window. Double-click a row to display all of the items from its group in a new window. 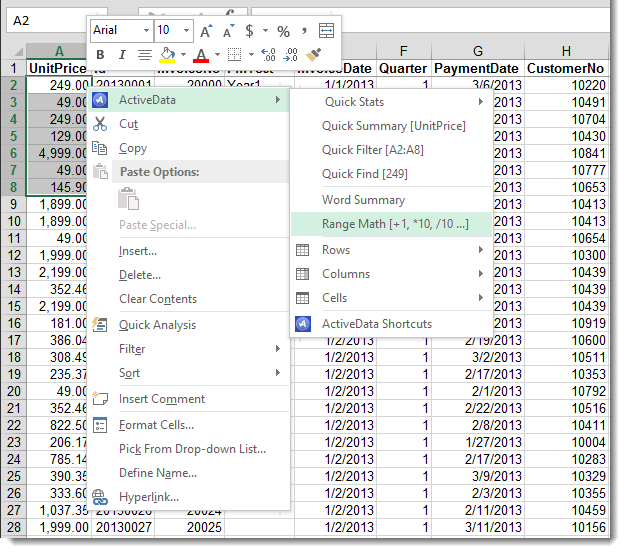 Click on the Excel icon to have the contents of the window saved to a new Excel worksheet . Click on the Sigma icon to add total columns. Note: You can press Ctrl while selecting this menu option to select total fields before generating the summary. 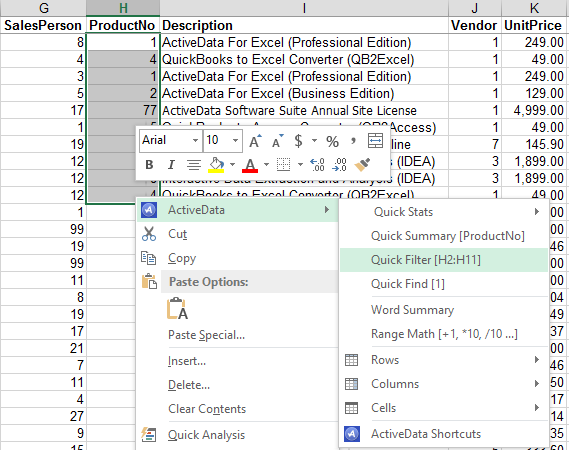 "Quick Filter" adds the selected cell values to Excel's data filter. 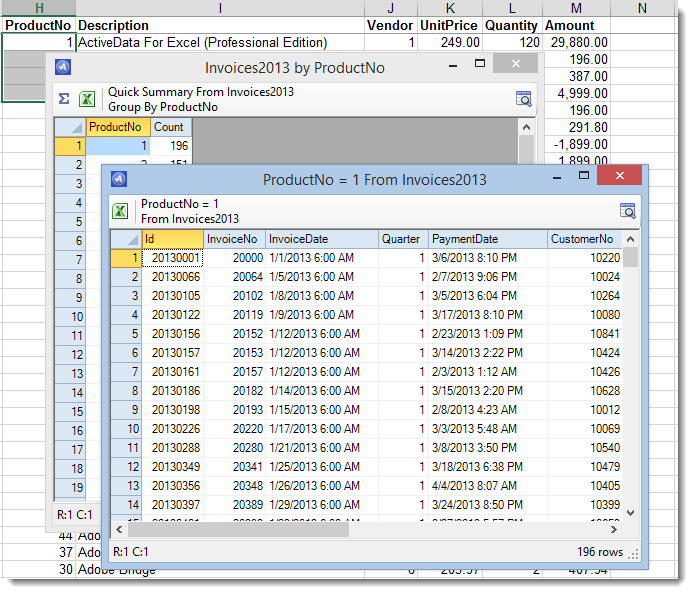 Excel only allows you to add one value at a time. 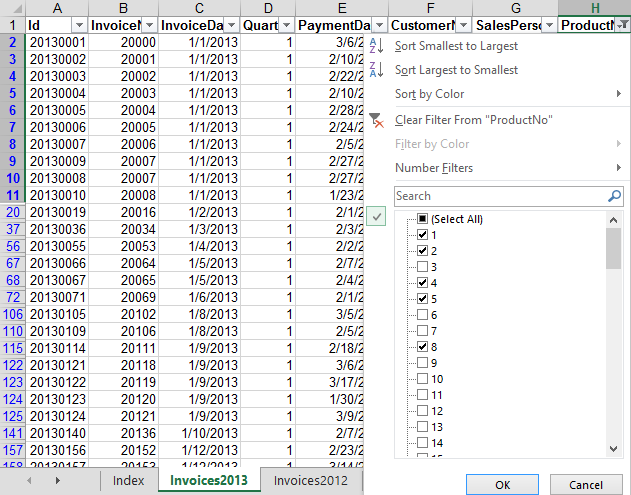 This results in the values being applied to the filter (Excel applies only the first value in the selection). You can add other values to the filter by simply re-using the Quick Filter command. 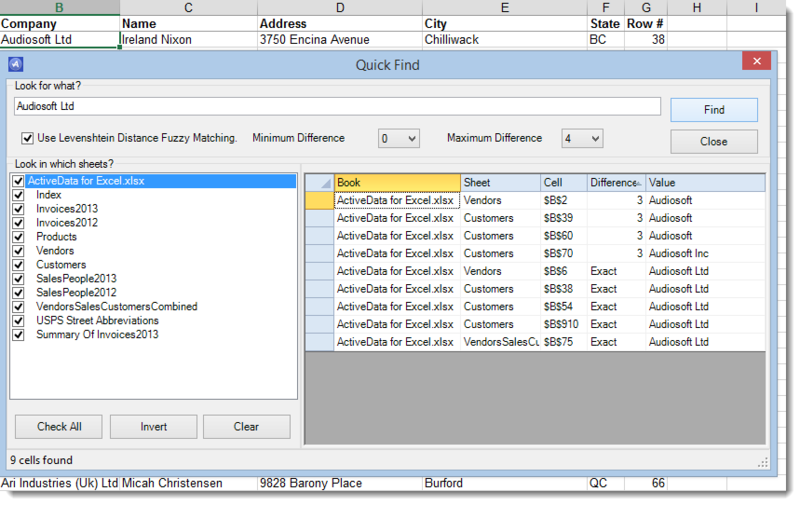 This lets you search all open sheets for the value in the current cell (or whatever you enter). This command also supports fuzzy (Levenshtein distance) matching. This combines all of the text from the highlighted cells, breaks it up into words and then produces a summarization including a listing of each word encountered and the number of occurances. The "Range Math" command allows you to apply an expression to the currently selected cells. In the following example, the cells in the selected range are multiplied by two. You can reference other cells in the expression using A_not_found1 notation. You can also reference the current row number using %r. 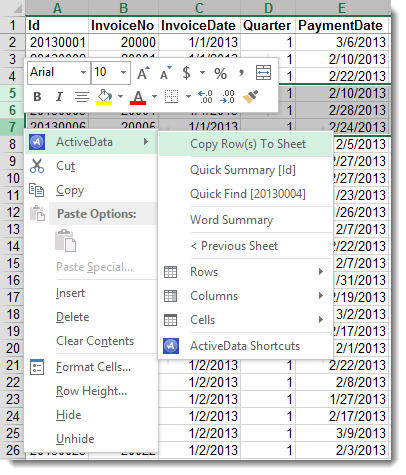 This command lets you copy the selected rows to the end of another sheet. You select the rows you'd like to copy by clicking (and shift / ctrl clicking) the row numbers on the left hand side of Excel's grid. After selecting this command you're asked to select the destination sheet. 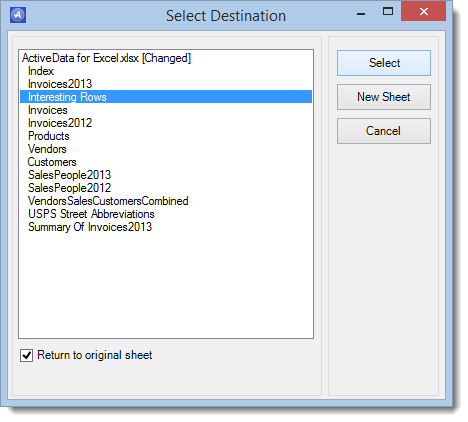 The selected rows are copied to the end of the selected worksheet. The Duplicates command now supports fuzzy matching using Same-Same-Similar testing. This allows you to identify similar items using Levenshtein distance matching. 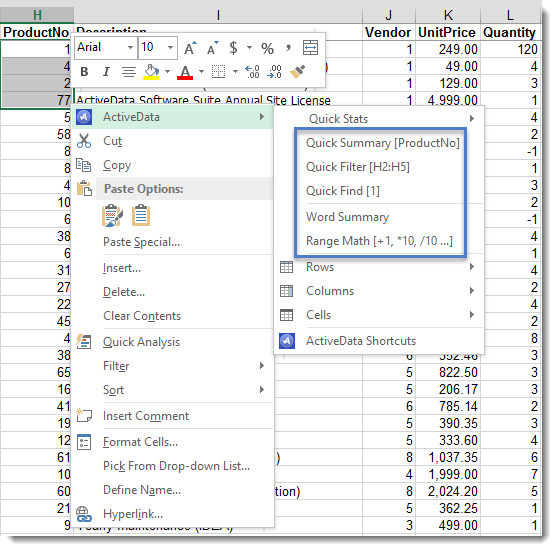 Word Normalization and Replacement - this allows you to replace common abbreviations and remove noise words using a user defined list of words stored in a worksheet. Word Sort - this breaks the data up into words and then sorts them. This can be useful in address matching because the numeric portions of the address will end up on the left hand side. Added a "Create Rightmost Column", "Split Email" and "Split Url" option to Split Columns. "Create Rightmost Column" captures the rightmost word from the original column. "Split Email" splits an email address into a name, domain and top level domain. "Split Url" splits a web address into its component parts. 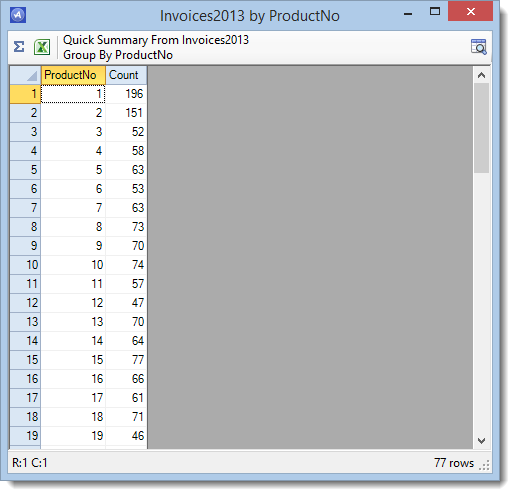 Added "Starts With" and "Ends With" conditions to the Tag Rows By Column Value command.